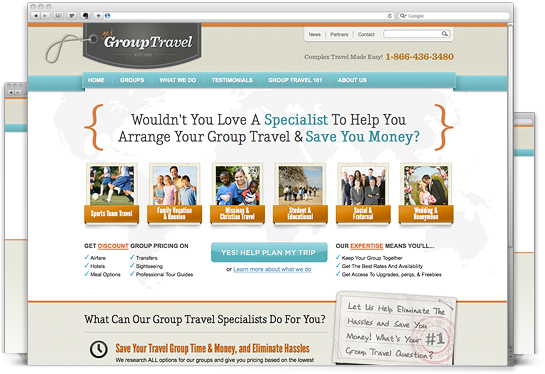 Get Group Travel was designed, built, and is managed by GreenTent as an information portal for individuals and organizations seeking group travel services. The objective is to use the content-rich site as a way to educate prospective clients, highlight related hospitality businesses, and generate leads for the company's comprehensive group travel services. GreenTent Design & Marketing is a team of talented designers, experienced Search Engine Optimizers, and internet marketing masterminds who leverage their 40+ years combined experience in web development and graphic design along with expertise and degrees in computers, arts, marketing and communication, to drive a business strategy based on delivering results for every client. What sets us apart from the other agencies is our development process based on strong communication and custom solutions that fit even the most challenging demands.